The crux of the argument by those engaging in BDS against Israel is that, no, they don’t single out Israel because it’s a Jewish state or because it is an ally of the West. They choose to boycott only Israel, they claim, because it’s a democracy and should therefore behave like one – and because boycott of a tyrannical regime doesn’t work, whereas boycott of a democracy can influence its citizenry to lobby for change to the offending policies. So, you must lobby universities to boycott all Turkish academics; even if they personally oppose Erdogan’s thuggish ways, they are still complicit. You must urge all dignitaries not to visit Ankara and all politicians not to speak to their Turkish counterparts until the country mends its ways. You must lobby to cut all cultural contacts and exchanges. You must organise marches and university demonstrations against the racist Turkish entity. Above all, each and every one of you, must refuse to consume Turkish Delight and all other products of the region, and boycott and picket vociferously the shops and candy stores that sell them, even at the risk of appearing ridiculous in the eyes of the public. The cause demands it. If successful your campaign would of course hurt the people of Turkey, especially the poorest, who might well lose their jobs. But that is a small price to pay for your moral stance and your sacrifice, and surely the Turkish people, even if unemployed, would take the long view and be grateful for your selfless attention. They will surely understand that you single out Turkey for BDS, for cultural isolation and economic deprivation, because you are their friends. Sadly the last BDS you organised – against, naturally, the Israeli people – didn’t turn out so well. Indeed, the Israeli economy is thriving like no other. But you might have better luck against, sorry, with Turkey. I loved this marvelous satire. If only it could really happen. Oh, well! I think a great idea. It is not only that Israel and Turkey are democracies, there is also the fact that Israel uses the Ottoman imperial legislation to evict Palestinians off their lands. Jim when you write, “Israel uses the Ottoman imperial legislation to evict Palestinians off their lands”, naturally you mean Palestinians being evicted off Israel’s land. What a satire, Geary. Wonder how many BDSers will understand it? Hey, Kim Jerby, why don´t you get lost, pathetic troll? Israel is either democratic or an aparthide state. You should make up your mind. BDS is all for the destruction of Israel making their true goal sound nicer for people like you. Jew-haters such as Jim Jerbyl don’t care about logic. They can hold all types of contradictory beliefs in their obsessive saga. McDonalds too? They refuse to lease any franchise on occupied territories. If McDonalds do that. BDS is definitely mainstream. BDSholes are fanatic anti-Semitic losers, just as yourself, “alex”. McDonalds is not boycotting anything. The israeli franchise of McDonalds fully owned by Omri Padan – a far left political activist, one of the founder of Peace Now – won’t open a branch in Ariel. It has nothing to do with McDonalds only with an Israeli business magnate. Anyway it is only his loss and a win for the health of the Ariel population. Indeed. Not frogetting that Ariel will stay in Israel in any future agreement with the Palesitnians. Jim Karby, you are just a poor mouthpiece for Arab propaganda since no apartheid state has ALL of its citizens voting and even has Palestinian members of the Knesset! But people like you just parrot what they’ve been told and don’t look at the real situation in Israel for yourself!! Great idea. But the real danger is the possibility of Turkey joining the EU. Even the numpties in Brussels have become dimly aware that allowing an Islamic state membership of the EU might cause a little resentment amongst the general population, but they haven’t yet had the balls to tell Turkey to F*** off. The vast majority of Europeans are horrified by the prospect, and our efforts should be directed to ensure it never happens. Any new member of the EU will have to adopt the Euro. No-one’s that stupid. Indeed, which make all the EU members racist. Andy do not worry the Europeans are thinking how to transfer bits of Europe into Asia – In human terms they have done it before remember the Balfour Declaration. Only thing is whose country they are going to give to those living in Istanbul this time and how are they going to convince the Turks in Istanbul to leave? Another Holocaust? In fact, Europeans promised one thing to the Jews but then changed their minds and created Jordan as a gift to the Hashemite family. I bet you are protesting and whining vigorously about that artificial creation, right, Kim Jerby? Jordan was promised to the Jews? b) On what grounds would that have been done? I’m merely querying your post, Mr. Bigot. Stalking is stalking, mr. plankton. God you’re such a bore. Who’s forcing you to stalk me, prattleplankton? Exactly. Pretz, this post by SJ is entirely non-controversial. The British (and the French for that matter) did not cover themselves with any glory at all in their machinations over the former Ottoman territories that now compromise Israel, Jordan, Syria and Lebanon. This was a notorious period of double-dealing, betrayal and counter-betrayal in which pconflicting promises were made to all sides and policy changd as the reality on the ground shifted in a desperate attempt to retain some sort of influence in the region deapuite the inevitable end of the Mandate. This has all been thoroughly documented in many places and, although perspectives will differ as to who was most roundly betrayed or crapped on by the British, the fact that they did betray and crap on everyone is not disputed. You must be joking, Labenal. The land east of the Jordan was promised to the Jews? But it wasn’t, was it? And anyway: on what grounds would just a promise have been made or justified? Sure the Brits and French mislead all the other parties involved. But SerJew’s post is – not surprisingly – ludicrous. And note how SJ is uncapable of actually defending his comment. Sorry, Pretz. I have just re-read the comments, and have now seen the “Jordan promised the the Jews” bit. That was not immediately clear from my first reading of SJ’s comment. I stand by what I said about the British and the French, and the wording of the Balfour declaration, the San Remo conference etc are all somewhat ambiguous, lending SJ at least a modicum of credibility, but no – I don’t believe that the WHOLE of Mandate Palestine (which of course included Jordan) was ever promised to the Jews. Sorry for the misunderstanding. My failt. You can’t ask that much from a planktonic selective skeptic. It’s not my fault that you are an ignorant stalker. I do. You presumably read propaganda books. Care to share your reliable sources with us? The British promised to establish a Jewish National Home in “Palestine” whose borders, when finally defined after WWI, included land east and west of the Jordan River. Then a bit later the Brits carved Jordan to the Hashemites and declared it Judenrein. This was almost 80% of the Mandate given to the Arabs. I already boycott Turkey for allowing the Zionists to make colonies on Palestinian Land in the first place. Bit difficult on the Kurdish issue as Kurds are not driven off their lands. They still live in Kurdistan under Turkish occupation. Don´t forget to boycott the US for occupying native-american lands. Also, I hope you are protesting vigorously against islamic colonies in the Balkans. Maybe you should boycott Turkey for taking the wrong side in WWI. Moron. You can stop boycotting Turkey, because Jews living in the land of Israel, (which is the indigenous name, not “Palestine”) is not up to Turkey. Turkey has neither the right nor the power to allow or disallow it. I’d like to tell you to get lost, but I realize that you already are. 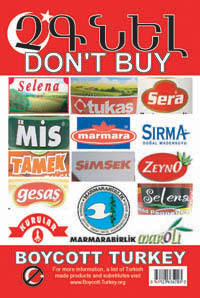 I already boycott Turkey for allowing the Zionists to make colonies on Palestinian Land in the first place. Right on. Me too. I also boycott the Brits for allowing the creation of the Israeli state, the US, the EU, India, China and Brazil for doing trade with Israel, and the Russians for under-arming the Syrians (where are the nukes, FFS?). Yours, living happily off plankton in the Pacific. And the above comes from the cretin who accused me of stalking him! SerJew = no substance, and even less style. The classic tabloid troll. Not so much stalking as stepping on by mistake. If you have anything of substance in response to my posts, go ahead and comment. Otherwise: shut up and go away. in fact it’d be nice to see you write anything of substance in response to anyone’s posts. What a pathetic whiner, Listen, mental midget, I decide what I post or comment and I don’t need the approval of an insecure twerp like yourself, planktonberg. You are wrong about Ottoman law being used by Israel to impose draconian measures on the Palestinians. The legal basis for it is straight out of the British Mandate. So start with boycotting Britain, and then move onto Germany, for letting so many ‘zionists’ get to Palestine before they could be murdered. Jim, you are just another racist bigot, with a visceral hatred so deep, you mistake it for left-wing love and compassion (for victims of the Jews only) of course. Do you also boycot China? Gerald if the Israelis were already living in Palestine from time immemorial how come there were pogroms in Europe. I hope you are not one of those Holocaust deniers. If “palarabs” existed at all, why the heck they never whined when Jordan occupied Judea and Samaria? Weird, isn´t it, Kim Jerby? If the English were already living in England from time immemorial how come they got chased out of America? Why do people insist on calling Deutschland Germany? Who lives there, the Germans or the Deutschen? If the Palestinians are the indigenous people of the land of Israel, why did they take so damn long to announce it? If the Palestinians are an ancient indigenous people, why’d they wait so long to mention it to anyone? Why such a long held secret? Do you suppose they wanted to surprise everyone? Why have they usurped the name of a long extinct non-indigenous people of a completely different culture? Ah … those glory days when the sun never set on the Empire. And why? Because God didn’t trust the British in the dark. You’re just making a special effort to offend, aren’t you? They were also pogroms in Islamic countries. Kirby is ignorant. Kirby is a provocateur. Kirby is cheeky. Why humor him? He’s bought into Arab propaganda because he’s been taught to hate Israel. It’s a pity such ignorance exists when a few minute with Wikipedia, Google etc. would convince anyone with a modicum of objectivity that the truth is the Israeli version not the Arab one. CifWatch is a magnet for anti-Jewish nutcases. Indeed, and it´s a measure of the blog’s success. And it´s a pleasure to trash these post-modern self-righteous anti-Semites. Actually it is not just anti Jewish nutcases. There are some here who treat any comment that isn’t backbendingly servile as proof of Nazi party membership. Also to say as you do that the Israel version ” is the truth ” shows a worrying lack of investigative spirit. It is as disturbing as any Jew hating Hamas diatribe. Common sense should make you realise there is no absolute truth. Both sides have carried out appalling and mystifyingly brutal acts of savagery killing thousands of civilians between them. That’s the truth. Don’t you dare talk about common sense when it’s plain to see you haven’t got any. What is truth? – didn’t your mythical NT hero allegedly ask that same rhetorical question. Fair play compels us to admit the Israelis are more sinned against than sinning. Not you? You’re just a sore loser. Roscoe Burns: It just so happens that when I say that the Israeli side is the truth, that statement is backed up by many years of investigative research into Israel’s history in the 19th and 20th centuries. If you check any of the statements against original sources, such as a British census in 1870 of the populations of the Palestinian territory, you will discover that there were more Jews that lived there than Arabs. Frankly, the land was too barren and inhospitable to allow large populations of either group to live there. The Arabs did not consider themselves to be “Palestinians,” they considered themselves to be southern Syrians. (I don’t recall the Arabic term, but you can look it up.) After the large groups of Jews started reclaiming the land, a great many Arabs emigrated from all over the Middle East. So, in reality, most of the Arabs living in the Palestinian territory actually came AFTER the Jews from Europe. When Jordan conquered Judea, Samaria and part of Jerusalem in 1948, it was renamed the “West Bank.” The Arabs that lived on those lands did NOT consider themselves to be part of a separate political group called “Palestinians” and NOT ONCE in the 19 years (1948-1967) that Jordan occupied that land, was there even a hint of creating a country called “Palestine” on that land! It wasn’t until that land was under Israeli control, that Yasser Arafat — an Egyptian — formed all of these Arabs into a group that is known today as “Palestinians” with the creation of the PLO. The purpose of the PLO was and is the destruction of the state of Israel; a homeland for “Palestinians” is only a means to an end! Also, for the record, Israel has NEVER deliberately killed Arab civilians!!! And prior to 1967 you will not find any mention of “Palestinians” fighting the Israelis under their own name. I challenge you to check any newspaper, including Arab ones, and find any reference to “Palestinians” as a group prior to 1967. YOU are the one who needs to investigate history to learn the truth!!! Thanks for another prove of your ‘intelligence’. Another absolute truth: Rascal Burnout is a douche-bag. Standard moral equivalence by these types of Jew-haters, trying to look “fair” and “balanced”. The masquerade goes on. Postmodern anti-Semites are just pathetic cowards. This is brilliant but who is Geary and where does he/she blog? Fritz – Oh my o my the ethnic cleansers are hot on racism today. What is the matter? Discuss this with the EU. And while you are talking to them ask the Germans why they agreed to compensate the victims of the Holocaust if it was my predecessors that were responsible for the Holocaust and not the Germans. Do you read anything ? By the way I like your insults. You like to be Antisemite and racist? Okay, that`s a straight answer. kerby, in fact, we Jews should be demanding that Britain offer its apologies for the British contribution to the Holocaust, in that Brit officials who thought like kerby violated their mandate to rule the country, that the League of Nations recognized as the Jewish National Home, by drastically limiting Jewish immigration to their national home home during the Holocaust when the Jews most needed a home. And meanwhile we have Erdogan ranting on about the “global media” and “interest-rate lobby” – and has even tried to link these shadowy opponents to the unrest in Brazil! I likewise think it is worthy of praise – but does the author himself consider it satire? It’s more a case of just holding up a mirror to the hypocrites. Now wind forward how many people today believe that fairy tale of land without people and people without land apart from the very few who refuse to leave the mental asylum. .
That`s your proof, a citation of wiki? Funny that you don`t cite some Arabic sources. If we go into depth the vilayet in the Ottoman empire was a small outlet which didn`t cover the British mandate at all, not to speak of the original mandate with Transjordania, Jerusalem had a Jewish majority and there still lives an Arab minority in Israel, Jim Racist. jimbo, you are sadly lacking in reliable information. Here is some useful instruction in the history of the Land of Israel and of the various names applied to that country. You will find that the Romans called it Judea at the height of their empire. I am not sure people like him want the real history. They SURELY aren´t interested. Notice that this douche-bag Rascal Burned already came up with the convenient & standard post-modernist crap about the non-existence of truth. Your Antisemitsm is enhanced by Wiki? That`s your way of widely reading? Vilayet? A senseless citation of your part as it doesn`t refute my statement, Jimmie Racist. Antisemites are per definition fools, as you have successfully proved.Thanks. By the way, the ‘Reply’ function (which normally nests replies under the original comment) doesn’t seem to working. Oh, yes, just to let you know, I’ve been an Israel historian for over 30 years. What are your qualifications? How silly of me; it’s obvious that you have none!! I will now read your other posts with great interest. Have distributed your Turkey article widely! Great to see you back Joe.